For many years Moofushi was an almost private all-Italian resort. The transformation into an international 4 star premium all-inclusive is stunning, an utter success. This small category is producing the best new holidays in the country at the moment. Lily Beach, Robinson Club and Centara Grand are the others in this new category (although Lily Beach may be considered 5 star). What unites them is the ease that comes when everyone has everything ‘free’. For guests, there are no tensions about extras, however many they have or at whatever time they want them. For staff, the feeling they get from guests at ease is given back in happy conversation, help and service. 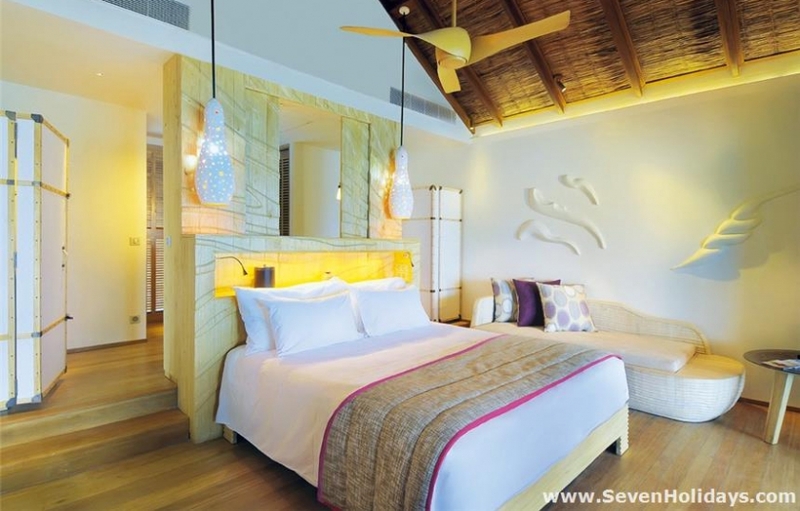 What distinguishes Constance Moofushi from the others is its French Overseas style, as delivered by this experienced, top-end Mauritian company. There is an accent on providing fine food and drink with white-clad, attentive service. 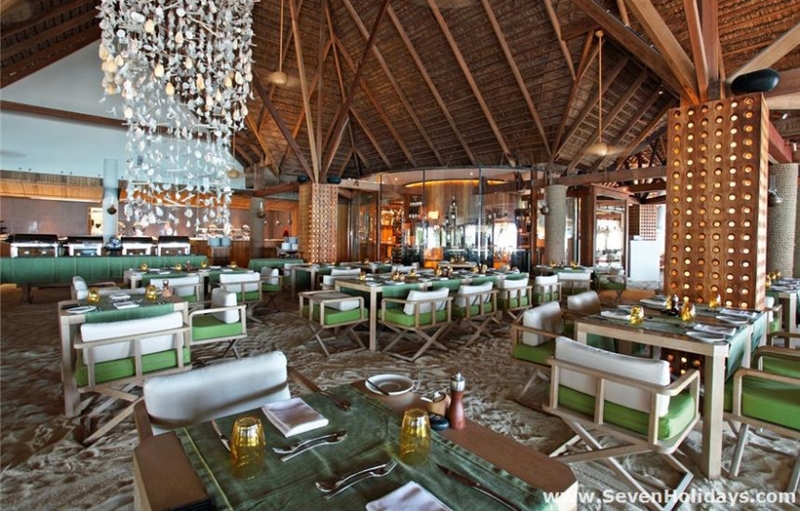 There is an elegance to the whole resort yet, at the same time, it has a cool beach -traveller look and feel. The Beach Bar is the totem of the place. It’s cool, like the bar you would choose on a long stretch of beach with many alternatives. Trunks of wood for seats at the counter under thatch, where conversation and wit get together to pass a little time in the shade. 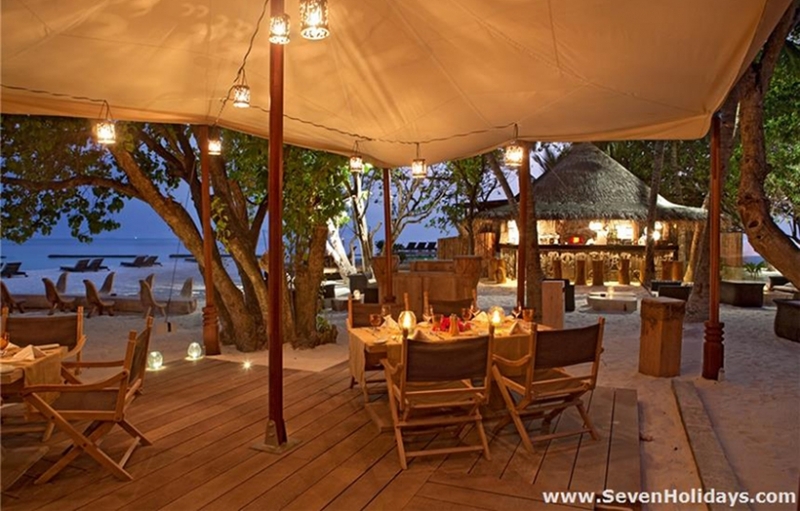 On the sunlit sand are low slung seats and more trunks, levelled-off and used for tables, long and short. As dusk falls the mood changes, candle lamps come out and reflection and soft words take over. The premium in the all-inclusive means there are no compromises on the quality and variety of the buffets. Reacting to any changes in the nationality and preferences of new arrivals, the executive chef and his team do a remarkable job in pleasing everyone. And then there are the 3sommeliers: one for the specialty restaurant (Alizee, on the beach) and 2 for the main buffet restaurant. 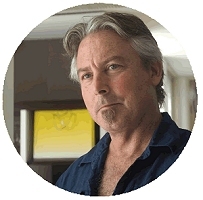 They do a great job guiding diners to good wines to augment the enjoyment of each course. One can pay for a special wine or champagne but with over 150 labels included, most guests are more than satisfied. There are no motorised watersports here and everything available is included, except for the catamarans. Further free activities are the gym with personal trainer and both aerobics and yoga with another expert. It is notable, however, that there is just one excursion included in the deal. The housereef was a wondrous place a few years ago. Sadly bleaching events followed by construction work has meant the coral life is only fair, with very good patches. History suggests it will come back to its former glory over time. Having said that, it is still better than many a resort right now, it’s just that I remember it as so impressive before. 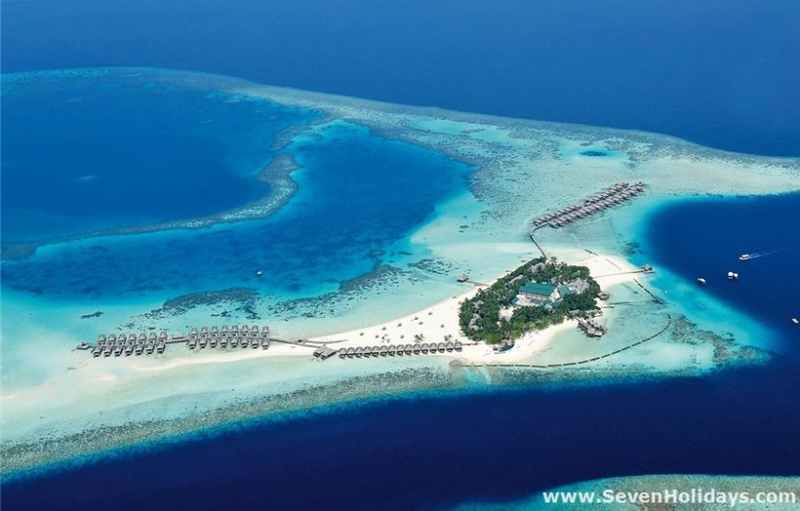 The fish life is still very good and the reef is accessible from the beach and the water villas. This is a very small island, the interior is attractive and mature but guests are guided around the perimeter. Happily, the beaches are fantastic. 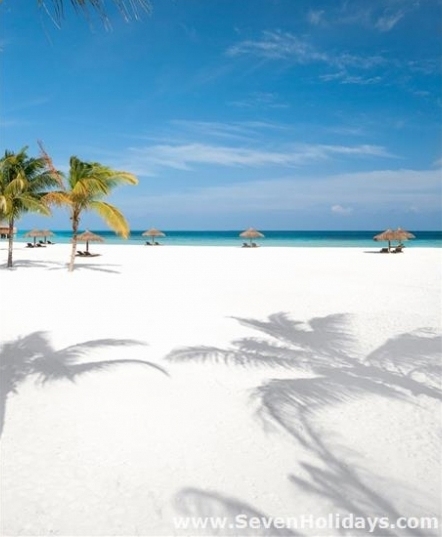 There are 2 huge bulges of lovely fine sand and just one small area of unnoticeable low island wall by the ‘garden lounge’, where a platform for sunloungers is placed. 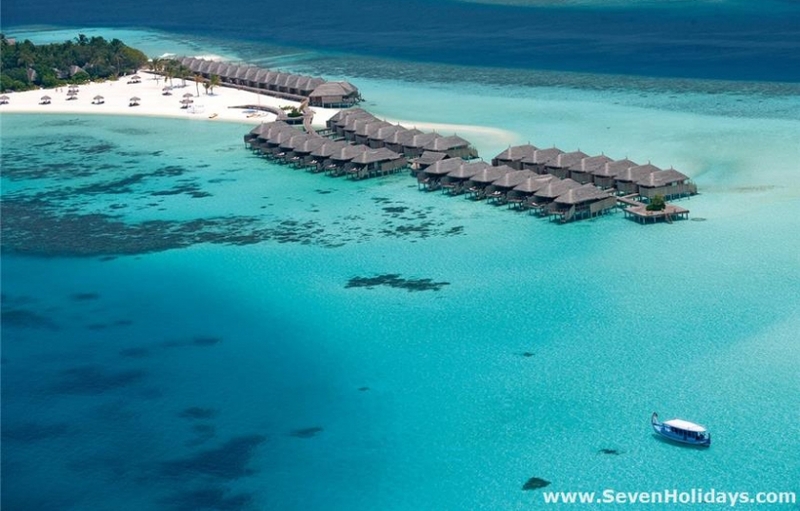 One of the beach areas extends out behind the original water villas. 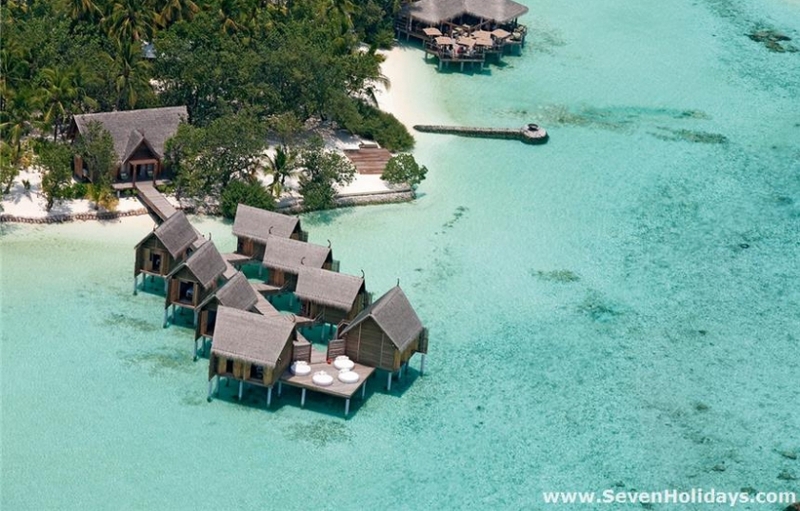 The decks of these villas have steps down to the lagoon yet their entrance is from a jetty above the beach. It is the best of both worlds for many Europeans. 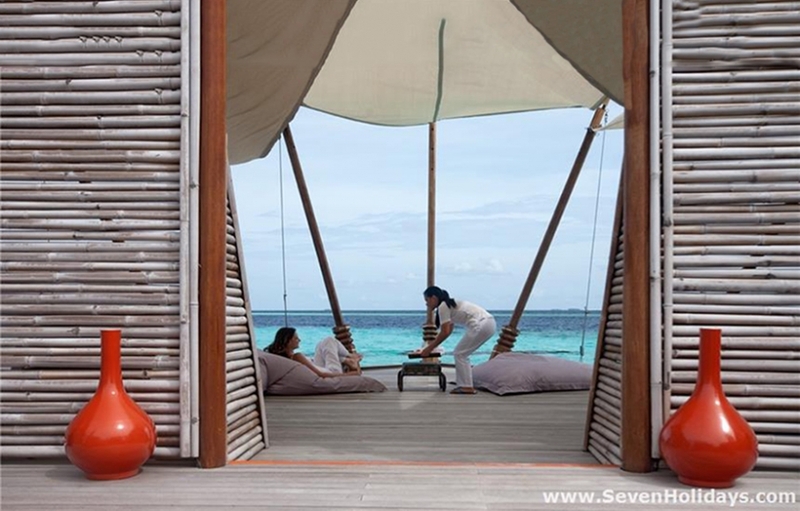 An extension of this jetty houses the new Senior Water Villas. These are more distant for privacy and a little larger, with a bath tub, and finer decorative details and amenities. A second jetty with all senior water villas entirely over-water is a favourite with the Asian clientele, who come mainly in the low season months. 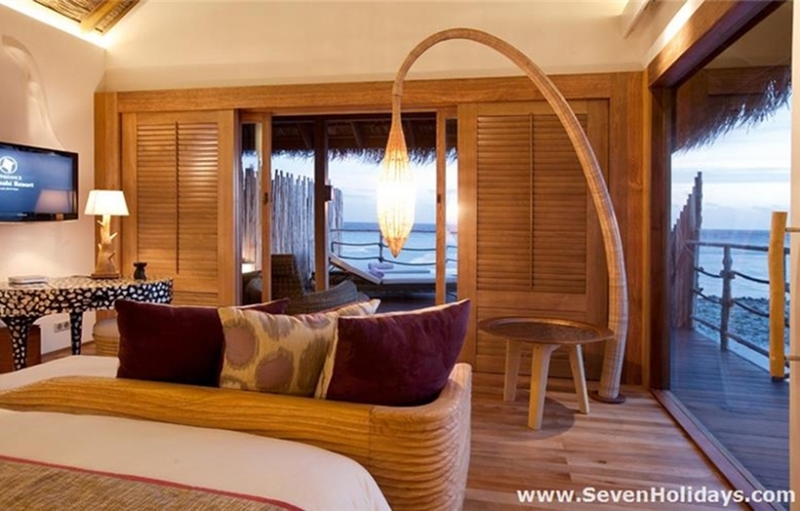 The rooms are built and decorated as the whole resort is: a modern interior design blended with rustic wood, rope, wicker and weave under thatch. It’s a lovely combination, both stylish and uplifting but warm and comforting too. That is not to say it is 5 or 6 star deluxe stuff. But the tv, entertainment and information system is the best around. Constance Halaveli has the same thing. It is based on free wifi, a mini mac and an intuitive 1 handset device. 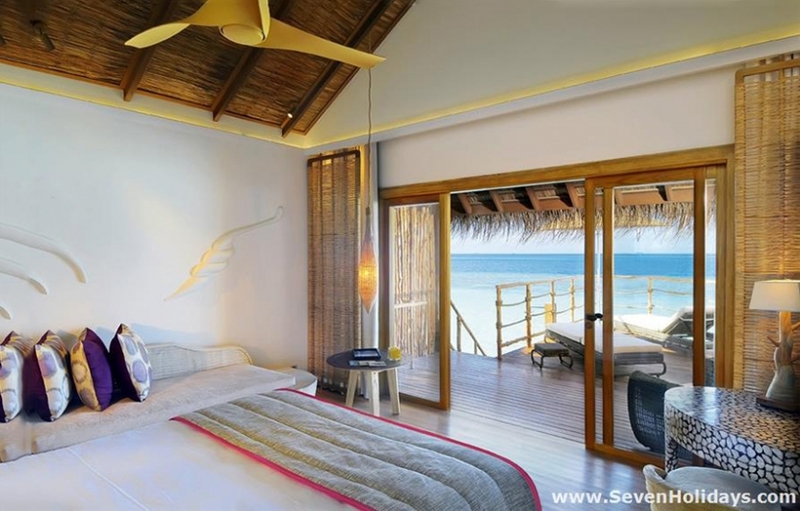 The all-inclusive price puts the initial holiday cost higher than that of Constance Halaveli and other 5 star resorts, but at the end of the holiday your bill is considerably less. Less or more, it is the highly trained, willing and unusually happy staff that make sure this a truly great resort.